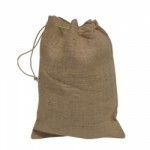 Natural jute pouches in 3 sizes from stock here in Coventry. All of our jute pouches are fitted with a natural rope drawstring top and the bags are not lined. Printed jute pouches available from as few as 50 bags printed single colour, price upon request. Natural Jute Pouches Sold pack of 10 bags Bag size 400x500mm Unlam..
Natural Jute Pouches Sold pack of 10 bags Bag size 350x400mm Unlam..
Natural Jute Pouches Sold pack of 10 bags Bag size 230x300mm Unlaminated with..